My brother, John Boshard, and I both attended BYU Training School beginning in kindergarten. We continued through the 12th grade at Brigham Young University High School. I graduated in 1961, and John in 1966. To us the Lower Campus was a cornucopia of things to explore. Whether we were looking at stuffed animals, sliding down the spiral fire escape, or climbing on the beehive fountain, there was always a diversion on the Lower Campus for kids with time on their hands. In particular, the old Men's Gym seemed to have a compelling magnetic attraction on us. When John and I were growing up, the old Men's Gym was one site where games were scheduled by the Provo City recreation department. They sponsored basketball leagues for kids ages 9-14, and both John and I played in those leagues. Playing in the Men's Gym was like competing on our home court. 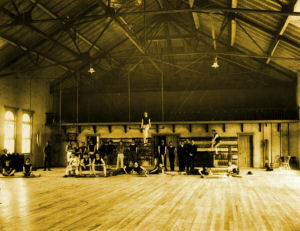 The third floor Men's Gym, also in 1902. This old gym and its dressing rooms took up the entire third floor in the BYU Training School building. 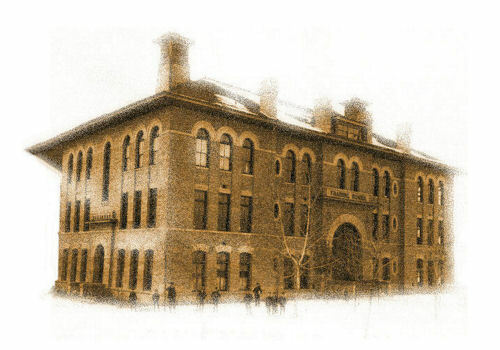 Our elementary grades were all taught on the two floors below the gym. To us, each of the elementary classrooms was a kind of separate cavern with high ceilings, big hallways, and antique desks right out of The Adventures of Tom Sawyer. The spacious Men's Gym was just as old-fashioned, and even more fun. 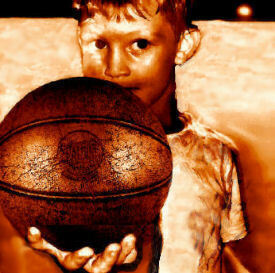 It came complete with old brown leather basketballs that harkened back to the turn of the century. For some reason the distant sounds of basketball players bouncing around in the old gym up the stairs never seemed to faze either the teachers or the students in the classrooms below. My favorite school teachers were Mrs. Lillian Christiansen (2nd grade), Mr. Garth Seastrand (5th grade), Mr. Wally Allred (Junior High), and Mrs. Julia Caine (Senior High). The only teacher I ever had any personal problems with during my BYU experience was Mrs. Flora Fisher in the 3rd grade. Robert Gledhill and I were frequent targets of her wrath. She did not hesitate to whack her ruler across our knuckles if our behavior was not to her liking. Our family lived near the Lower Campus from 1946 through 1957. Our house, located just a block away, had also been built around the turn of the century. It had a large bay window, high ceilings, and when we moved in, a coal-fired furnace. Dad had a garden behind the house and we had a stand-alone garage large enough for just one car. My father worked for a time as a shoe salesman at Sears. This was great, because he got discounts on top-quality sports shoes for us. As time went by, the shoes to have were high top Converse All-Stars for basketball and Jack Purcell shoes for tennis. During our wide-ranging free time in the summers and on many weekends we could usually be found playing basketball in the Men's Gym. While the gym was officially off limits to students who were not engaged in physical education classes or team sports, my friends and I started to devise many different ways to enter the gym. 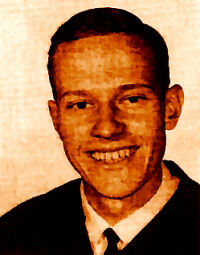 We began to be students of this wily art in the early 1950s when we were around 9 or 10 years old. For example, we would hide in the lockers until regular basketball practice was over and then take over the gym for hours of basketball. This became kind of an unsanctioned neighborhood league. On other occasions, we would bribe a janitor to let us into the gym. We brought them lunch and soft drinks, and sometimes helped them with their janitorial work. But the most effective bribe was to invite them to play basketball with us. One janitor, who lived near the Lower Campus with his wife and kids, much later told us that playing basketball with us was the best part of his life. One time we interjected ourselves into a creative dance class as "elves" and the instructor, not knowing we were not part of the class, commended us for our creative dance abilities. 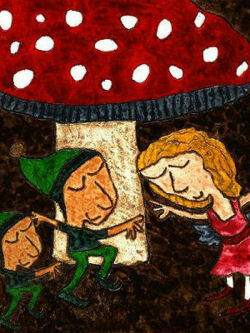 Creative dancers - with ulterior motives. When the dance class was over, we stayed in the men's restrooms until the coast was clear and enjoyed another afternoon of basketball. Whenever art failed to get us into the gym, we turned to science. Dee Kirbey's father, Erwin Kirbey, was a painter who seemed to have keys that would fit almost any lock. Dee would simply show up with a bag of keys, and we would try one after another until we found one that would open the gym door. The other members of our basketball group included Gary Smith, Dee Kirbey, Dickie Mangum, Allen Dixon, and Gary Johnston and Bruce Johnston, who were brothers. Except for Dee Kirbey, all of my friends attended the BY Training School at one time or another. I also played little league baseball with Dee, who was probably the most gifted athlete I knew who was my age. My family moved to Edgemont in 1957 just before I entered the 9th grade. John and I were not too happy about being cut off from our University Avenue friends and losing our easy walking access to the Lower Campus. While we both continued to attend the BY Training School, things were never the same, as we just never made it down to the old neighborhood except to attend classes and practices. We were both pretty isolated from the Lower Campus culture after we moved to Edgemont. John and I each went on to play on the junior varsity and senior varsity basketball teams at BY High. John became a starting guard his senior year. I did not play basketball my senior year because of conflicts with Frank Arnold, who was briefly the BY High basketball coach. Arnold proved to be the Bobby Knight of high school basketball coaches. Dee Kirbey had a rather tragic life and died in 1989 from alcoholism. His body was found in a ditch not too far from the Lower Campus and the old Men's Gym, where he and I had spent so many happy hours playing on our clandestine teams. All in all, the fifties were a great time to live around the Lower Campus where a kid could still be a kid and not be labeled a hoodlum for simply wanting to play basketball.